Whatever product or service you offer, the value is innate - but trust in your brand is not. To become the go-to-guy for your service requires you to follow through with everything. Complete the work and take the time to walk the client through what has been done and how you succeeded in each goal that was outlined. Creating a viable method of measuring success with your service and reporting that success to your client is invaluable to creating the foundations of trust and the best prize of all - brand loyalty. Here’s the thing - your clients will talk about you. What do you want them to say? If you don’t show your value, your customers will still share with each other, which takes control away from you. Did you know that 61% of customers read online reviews before making a purchase decision, and they are now essential for e-commerce sites? On the top of reviews, do you have a way to survey your audience? Being accessible is absolutely necessary to your brand, as responding to public inquiry in the voice of your brand is paramount. If you aren’t part of the conversation, that doesn’t mean the conversation isn’t happening. Reputation management still skirts the line between digital and traditional marketing and affects purchasing interest of your client. Reputation Intelligence is a great way to keep on top of all conversations about your brand online, as well as helps to keep your information consistent across all search engines. Be sure to have a dedicated person or team trained to answer questions, complaints, or compliments in an approved way. Make sure the information for your point of contact is highly visible. Keeping your social media accounts as up-to-date and managed is one of the primary tools of keeping an open line of communication with your audience. Recognizable branding helps your audience identify you as a trusted source of information. Disjointed and inconsistent marketing materials scream impulsive and unreliable leadership, and by extension, service. Color, logo, website, social media - all are invaluable to your brand and their connection to each other is imperative. It goes much further than simple aesthetics though, it extends to your voice and how you can be expected to react. •	What do you want them to see: do you want your client to see a color and think of your brand? What is that color? Is that color consistently shown through your marketing materials, digital or otherwise? •	What do you want them to read: your content is an extension of your authority and thought-leadership. Is it tailored to your primary audience, and are you opening the ground to continue the conversation? Additionally, consistently are you reaching out to your audience, through blogs, social posts, or otherwise? •	What do you want them to feel: this becomes the culmination of what they see and read about your brand. Are you showing yourself as the best option for your audience? Building the quality of trust comes not just from your services, but how you present yourself as well. The days of focusing purely on the client are gone by the wayside, and your presentation of yourself is as important as your work. Do you need help building your brand? Bloomerang Solutions can help! From reputation management to websites and social media, we're here to make you look you best. Give us a call today at (941) 806-1911 or drop us a line here to find out what we can do to make your business bloom! What’s the Difference Between Surveys and Reviews? The difference between surveys and reviews is that surveys speak to you - the business owner - from the customer. We attach a coupon to our surveys and it's usually the most redeemed coupon because it targets our own customers and the responses inform us what we can do to improve their experience. Reviews, on the other hand, allow your customers to speak to the world about their individual experience with your company. None of your clients have to select or login to any website or search engine, like Yelp or Google to leave a review. Once they leave the review, we monitor and push it to the web within a few days. Our Google-certified software allows companies getting reviews to be rewarded online with gold stars in their organic local listings. The more reviews they get, the better they rank for SEO. If shops get a bad review, we cannot remove it, but we will notify you to reach out to your customer to discuss what happened OR we will do it for you! This program is guaranteed. Anyone that runs a homemade program and does not allow negative reviews to be published is not using an approved system and cannot get the gold stars. Organic listings are FREE, and cannot be manipulated. Only a Google-certified program can achieve the gold star rankings. Now you know the difference between surveys and reviews. •	Review Monitoring: Monitor all of the location reviews from customers — including those on third-party sites like Google, Facebook, and Yelp — in one place. Automated notifications alert businesses to new reviews as they appear. •	Review Generation: Encourage real customers to submit reviews based on actual visits and experiences. Leverage email, SMS, receipts, and five other channels to leverage in search. •	Review Balancing: Bloomerang’s review balancing algorithm dynamically chooses the most impactful site to direct customers to ensure an even distribution. •	Review Publication: Publish the reviews you generate to your business website or app with pre-optimized Schema.org widgets so stars appear in your organic search results. •	Review Response: Respond to reviews where needed. With workflows and approval settings, local managers can respond to reviews for locations they manage. •	Review Insights: Analyze review trends and changes over time so you can remedy issues as they arise–and reward loyal customers as you so choose. How often do you talk to your customers to find out what they think? It’s simple with surveys from Bloomerang Solutions. We can help you customize surveys for you shop that will tell you everything you’ve always wanted to know (but never asked). Best of all, we can get this up and running on your site by the end of the week. Take the guess work out of customer service with surveys from Bloomerang Solutions. Give us a call at (941) 806-1911 or drop us a line here for more information. 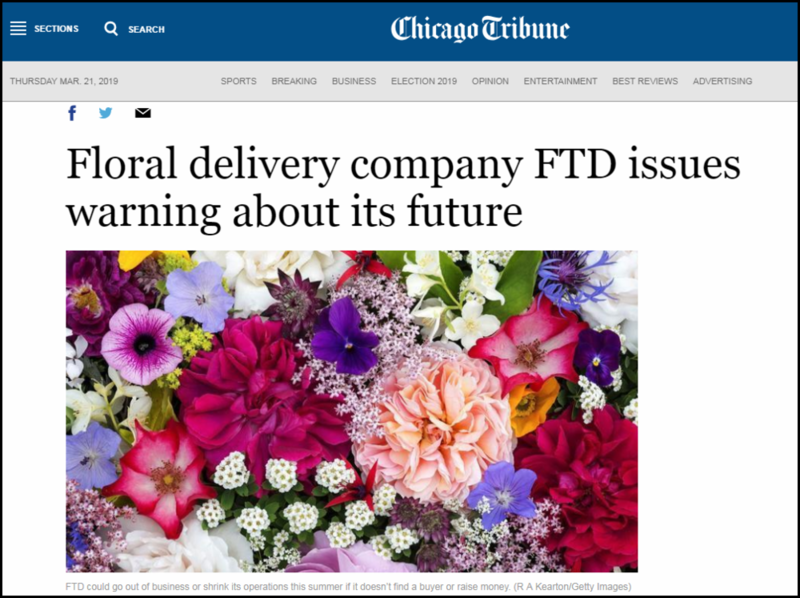 At first glance, that sounds like terrible news for the floral industry, but we spoke to our sources at FTD who clarified what was being reported and assured us they’re not going anywhere. This is a time to think about where you feel most comfortable. Who is running your technology and what is most important to your business? Is it just about orders? Is it about running your business? The truth is while this sounds more scary that I believe it is, FTD borrowed $400 Million and now owes $215 Million and is still making money. This is not a sign they would go anywhere. They can and should make more, but they are NOT losing money and that would be a concern. Teleflora, on the other hand, is privately-owned and as far as I have seen, a very stable company. But if the family uses funds for whatever reason, to do anything, they do not owe any explanation. I would like to see shops work together as teams. FTD and Teleflora both have their own strengths and shortcomings - so what you need for your business is most important. According to FTD, the company filed its year-end 10-K (as required for any publicly traded company) but the article failed to characterize it properly. Any time a public company has loan or credit agreements, they are required to list any risks associated with the amendments of that agreement. FTD is a billion-dollar company and will reach $40-50 million in EBITDA in 2019 so there’s no reason to panic or overthink this report - FTD is not going anywhere. In fact, they are currently working on a new cutting-edge website platform that they plan do roll-out early this summer. With this new platform, FTD is focusing on the needs of the retail florist by upgrading and enhancing the back-end capabilities of their websites. We’re excited to see how well the new changes perform when they begin upgrading their current websites in waves starting on June 1. As this news reaches more people, the industry is starting to react and take action. Floral Systems, who offer point of sale products has issued the following release urging FTD customers to consider other options. The truth is, FTD borrowed $400 million and in 5 years has paid down the debt and still maintaining a profit. They have plans to create new back end systems and acquired a company most recently to help them improve the websites as clearly, we all know, we need more than a fancy landing page these days. They are making an effort. Having POS companies play up on this? Well, I just think everyone knows what is available and the relationship is the difference. Who hears you and treats you best? This should not be a reason to jump ship in my opinion as I have heard comments that FTD will be gone in six months several times. I would just say, if you do not care for one or the other wire service, let them know. They need you to survive, FTD is far more aggressive and with good reason. This is and has been the ride with them for years and years. Your business should rely on YOUR needs and communicate with whoever could do a better job for you. Wire services like Teleflora are the ONLY ones who do not ship flowers in a box and other than that, it's personal preference. I applaud them for that but understand FTD is up against 1-800 Flowers and if one does it, the other does too. That's my 2 cents. What's yours? Bloomerang Solutions can help your business bloom with custom websites, reputation and social media management, online marketing with Google and much more! Visit our website or give us a call at 941-806-1911 for more information. In order to run a successful business, you need to make smart decisions that often require utilizing different levels of effective trade secrets or strategies in order to achieve that success. But what happens when new opportunities like social media or pay-per-click advertising come along? These are not only ways to run your business better, they are opportunities that need custom strategies. When they are working correctly and effectively, they could be the difference between success and failure for your business. With something so important as the survival of your business on the line, do you really want give up that much responsibility to a fresh-out-of-school employee simply because they "know the lingo" of social media? If so, it's important to first learn exactly what these so-called "socially connected" kids know and find out exactly how they plan on utilizing your social media accounts. They may talk a good game and know how to get your listings live and looking nice, but do they know how to properly utilize all the available business features? How are they measuring results for you? Are they constantly searching for the next new strategy that will give you an edge? Can they tell a good idea from a bad one? And most importantly, is the person doing all this for you going to stay with you for 5 or 10 years? If they leave, what will you do? There's a lot more to consider when hiring a social media professional for your business because there is a lot more on the line. Social media for business is a completely different animal than posting selfies and memes. Remember, everyone you meet can call themselves a "photographer" because they carry a nice camera in their pocket, but that alone is not a good reason to hire them to shoot your wedding. As with most things in life, you usually get what you pay for when it comes to your social media. Unfortunately, most small business owners don't have the resources to hire a full-time professional social media manager so they hire someone cheap with little or no experience and hope for the best. Hiring a professional to run your social media will ensure professional results and is less expensive than hiring and training your own full-time employee who you'll also have to manage - plus you don't have to offer us benefits or cover days off! Our focus is on keeping you as a client and not auditioning for a better job offer. We're already exactly where we want to be and that's with you - not with whoever may come along offering a higher salary. We can train anyone in your company to get them up to speed. Our social media experts are not only experienced, they live and breathe social media and stay on top of the constantly changing trends in the industry. Our staff does nothing but what you contracted for us to do - all day, every day! At Bloomerang Solutions, not only do we create an expectation, but we give you one that is reachable before we begin our work to get you there. Best of all, no contracts, just agreements! In other words, you'll never have to fire us - but you can quit any time you'd like with nothing more than a 45-day notice. If you ever decide to quit our services, it is our professional responsibility to turn over all information that is outlined in our agreement back over to you - it's your business, you're in control! Want to keep it in-house? Bloomerang Solutions is ready to handle your entire social media presence from posting to community management, but what if you already have a great staff member working on your accounts? Never fear - we can work with them to execute the strategies we create. We like to have a team on your end to work with, so that is definitely an option worth exploring if would like to keep a closer eye on the accounts you manage. So, what are you waiting for? For as little as $200 a week you can hire a group of experienced professional, get results, improve your sales and engagements, and now focus more attention on the rest of your business while never having to worry about who has your access and what anyone else is doing. Some of the best companies in the world understand this value. Unless you are big enough to run your own in-house agency, it makes sense to tap our knowledge base and let us get you results you desire. We're ready to help you supercharge your social media and achieve results you never thought were possible. Give us a call at (941) 806-1911 or email us here to get started or to simply talk to one of our agents to find out if Bloomerang Solutions is the right choice for managing your social media.